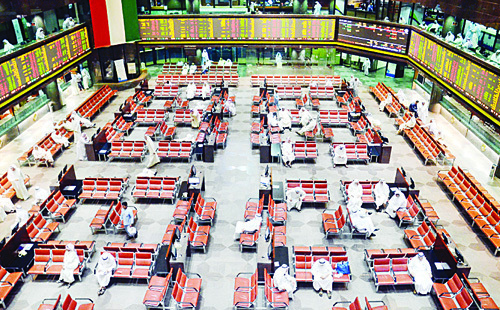 Photo shows a broadview of Kuwait Stock Exchange. The bourse closed lower on Tuesday. 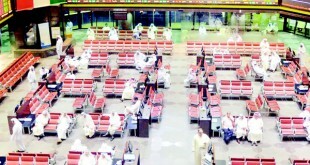 KUWAIT CITY, Sep 22: Kuwait stocks sagged slightly Tuesday ahead of Eid Al-Adha holiday. The price index pared steep early losses to close 4.33 pts lower at 5,754.49 points after pulling higher in last two sessions. Some of the banks and other heavyweight eked modest gains even as the board remained largely mixed. The KSX 15 barometer rose 3.43 pts to 937.45 points trimming the month’s losses 82 points while weighted index ticked 1.54 pts higher. The volume turnover meanwhile shrank after rising in the last two sessions. 128.82 million shares changed hands — a 14.16 pct fall from Monday. The sectors diverged during the session. Technology outshone the rest with 1.32 pct gain whereas healthcare shed 0.77 percent, the worst performer of the day. In terms of volume, financial services accounted for the highest market share of 29.4 pct while banks and real estate followed closely with 23.78 pct and 22.32 percent contributions respectively. Among the notable movers, sector bellwether National Bank of Kuwait rose 10 fils to KD 0.810 extending an identical rise in the last session whereas Kuwait Finance House gave up 10 fils to close at KD 0.570. Kuwait Food Co (Americana) jumped 40 fils to KD 2.380 partly recouping the steep loss on Monday. Telecom heavyweight Zain was unchanged at KD 0.395 after trading 2.44 million shares and Wataniya Telecom (Ooredoo) too did not budge from its earlier close of KD 1.000. Kuwait Telecommunications Co (VIVA) added 10 fils paring the month’s losses to 110 fils and Agility followed suit to wind up at KD 0.590. KIPCO was flat at KD 0.590 off early lows and Noor Financial Investment inched 1 fils lower. The company has posted a first half net profit of over KD 2 million and earnings per share of 5.07 fils as compared to net profit of KD 3.8 million and earnings per share of 9.58 fils in the first six-months of 2014. The market opened flat and pulled lower in early trade as profit taking weighed on select counters. The main gauge traded choppy thereafter and plumbed the day’s lowest level of 5,725.93 pts before clawing back most of the losses at close. Top gainer of the day, Kuwait Cable Vision Co spiked 7.14 percent to 30 fils while Sultan Centre climbed 6.94 pct to stand close behind. 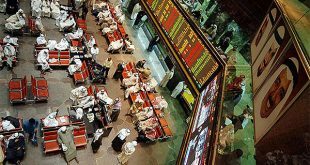 National Slaughter House slumped 7.14 pct, the steepest decliner of the day and Commercial Bank of Kuwait continued to top the volume with over 14 million shares. Despite the day’s downtick, the winners slightly outnumbered the losers. 50 stocks advanced whereas 47 closed lower. Of the 137 counters active on Tuesday, 40 closed flat. 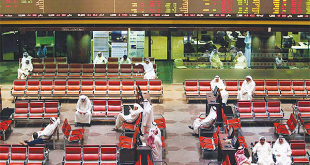 2,537 deals worth KD 15.18 million were transacted — a 25.2 percent drop from the day before. National Industries Group, the flagship company of Kharafi Group was steady at KD 0.148 off early lows while Gulf Cable and Shuaiba Industrial Co retreated 10 fils each. Heavy Engineering Industries and Shipbuilding Co slipped 6 fils whereas Boubyan Petrochemicals Co added 10 fils. Jazeera Airways rose 5 fils to KD 0.475 and Kuwait National Cinema Company paused at KD 1.000. The company has clocked a net profit of KD 5.98 million and earnings per share of 62.65 fils in the six-months period ending June 30, 2015. Zima Holding clipped 2 fils and Mezzan Holding Co dropped 20 fils to KD 1.020. The company has logged a net profit of KD 12.49 million and earnings per share of 42.13 fils in the January-June period of 2015, surging from net profit of KD 7.53 million and earnings per share of 25.41 fils in 2014, H1. Humansoft Holding Co was unchanged at KD 1.080 and Combined Group Contracting Co pulled 10 fils lower. Kuwait and Gulf Link Transport Co inched 0.5 fils up and KGL Logistics Co dialed down 2 fils. Independent Petroleum Group Co held steady at KD 0.305 and City Group Company was not traded during the day. The company has posted a net profit of KD 3.56 million and earnings per share of 31.51 fils in the January-June period of 2015. In the banking sector, Gulf Bank was flat at KD 0.265 whereas Kuwait International Bank took in 2 fils. Al Ahli Bank closed 10 fils higher and Ahli United Bank followed suit. Boubyan Bank added 5 fils whereas Burgan Bank held steady at KD 0.390. The banking group has recorded a net income of KD 37.4 million for the first half period of 2015 — a 12.3 percent growth from H1, 2014 while operating profits before provisions rose 10.2 pct to KD 80.2 million from KD 72.8 million in 2014. Kuwait Investment Company was unchanged at KD 0.106 and International Financial Advisors rallied 3 fils on back of 11.6 million shares. Securities House Co and Bayan Investment were flat at 50 fils and 43 fils respectively and Osoul Investment Co followed suit. 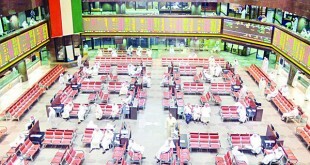 Sokouk Holding paused at 49 fils and Al-Qurain held steady. KMEFIC inched 1 fils into green whereas Al Mal eased 0.5 fils to 37 fils. National Real Estate Co stagnated at 80 fils while Mabanee Co climbed 10 fils. Al Mazaya Holding dialed up 2 fils to end at KD 0.104. The bourse was largely upbeat during the holiday curtailed week. It closed higher in two of the three sessions and gained 40 points week-on-week. It has dipped 66 points from the start of the month and is trading 11.95 pct lower year-to-date. KSE, with 213 listed companies, is the second largest bourse in the region.